Guest reviews -- more than 60 5-star reviews! "Warmly furnished and beautifully appointed. The kitchen is nicely laid out and had a better array of spices, knives, and pans than most vacation rentals." "The property was beyond our expectations. Through the many large windows on the sides and ceiling of the house, we felt embraced by the surrounding canopy of deep woods populated by deer, wild turkey, chipmunks and colorful birds." "Oozes with natural beauty. Being here has been comforting, fulfilling and cleansing." "I never felt so instantly at home at a vacation rental. You can tell attention has been paid to all the little things that make it so much more comfortable for guests." "The house is beautifully designed, maintained and was fully stocked." "The house is beautiful with very tasteful furnishings and decor. We loved the sauna." "Sparkling clean and everything we needed to feel relaxed and comfortable. Throughout the home were large glass window panes and wall-length windows, giving an amazing view of the surrounding mountains and woods." Restore yourself at this lovely vacation home while you explore Woodstock, Phoenicia, the Hudson Valley and the Catskills. House features sauna (dry or wet), plus steam shower, for spa-like pleasures. Delicious kitchen, comfortable furnishings, Weber BBQ grill. Short walk to swim pond shared with neighbors -- sun, float and picnic. Secluded and quiet, surrounded by woods, mountains and hundreds of acres of public land, and visited often by deer and turkeys -- yet just 10 minutes from both Woodstock and Phoenicia, lively, artistic, and progressive communities with great restaurants, galleries, shops, music, and street life. All modern comforts, tons of outdoor decks and a screened-in porch for outdoor dining. Mostly new construction with architectural character. Lots of big windows and skylights. Large modern kitchen/dining area flows into separate, large living room with wood stove. First-floor bedroom carefully designed for privacy with direct access to full bath. Separate small office with window seat. Spiral staircase to airy loft-like bedroom with 1/2 bath and private deck overlooking hillside. Wi-Fi throughout. Cable TV, including Netflix and other Internet-based channels. Refreshing summer breezes, A/C or ceiling fans throughout. Warm and well-insulated in cooler weather. Generator fully powers house in case of outages. Located on cul-de-sac between Woodstock and Phoenicia. Hiking trails everywhere, world-class fishing in the Esopus. Yoga, Pilates, bike trails, skiing and charming towns nearby. Keywords: House, cottage, sauna, steam shower, gourmet kitchen, woods, deer, secluded, private, Woodstock, Phoenicia. A health writer and a poet, we relish going from city to country and back again, and work hard to make the rental experience a terrific one for our guests. A loop walk through the neighborhood, up a mountain road to a great vista... a drive to Woodstock for the film festival or an outdoor summer concert.... Swim in the private, spring-fed pond, armed with cooler chest and towels, emerge refreshed and silken. Return home for a sauna, a campfire, a cocktail... Read a novel, watch a movie in still beauty... Breathe deeply... Feel calm. You'll love the steam shower and sauna. Tranquil setting with frequent visits from turkey, deer and owls. We're between the "downtown" areas of Woodstock and Phoenicia. Wooded setting in total privacy, surrounded by public land. AC in 1 Bedroom. Ceiling fans throughout. Thermostats in every room allow settings to be individually tailored. House is well-insulated and toasty. WiFi works well throughout house. Large glass panel provides fireplace-like beauty. Large, modern, very well-equipped kitchen with tons of counter space. Dining room table seats 6. An additional folding table and chairs allows 4-6 more. Both bedrooms have TV and Roku, including Netflix. One DVD player available in bedroom. Scrabble, cards, Trivial Pursuits, backgammon and more. Second-floor bedroom has private deck. Multiple decks overlooking woods, including a second-story deck. Screened porch. Enjoy a cedar sauna for 2-3 people -- wet or dry. Plus a private steam shower. We had all the information we needed to stay warm, fed, comfortable, and informed (PDF, maps, books about the area). The house is beautiful and has all the amenities one could want. Feels like a home, not empty as some vacation rentals do. Loved the sauna! Looking forward to returning when the trees have leaves and flowers are blooming. Wonderful, clean property in an amazing setting with an attentive host. Karyn could not have done a better job in making us feel at home. Perfect!! Great location near outdoor activities, shopping and dining. Host is exceptional! This is the perfect spot to explore the Catskills. Near everything. But what makes this house special is the quality of the property with upgraded features and critical facilities such as on demand hot water, good water pressure,high end sauna that heats up in minutes . This property doesn’t feel like a VRBO rental but family home. Host is available 24/7 however everything is perfect so only reason to contact her is to say thanks. Thanks so much, and we're delighted you had such a great time. We do try to offer the warmth and comfort of a well-maintained home, and I'm so pleased that came across during your stay! Willow appears to be a sweet spot in the Catskills, as it’s neither too secluded nor too developed, and this pretty house sits on a particularly prime piece of land. The evening of our arrival, I stood in the front yard and just listened—there wasn’t a single sound that didn’t come from a living creature. I recorded four whole minutes of organic pastured peacefulness on my iPhone, just because I could, and didn’t hear a single car or aircraft for the duration of the recording. Just the quiet and calm I’d been hoping for. The house is warmly furnished and beautifully appointed. The kitchen is nicely laid out and had a better array of spices, knives, and pans than most vacation rentals. It was easy to cook there. All the fixtures in the house are modern and in working order, though there are so many light switches I’m not sure I could ever learn them all. (I’m fairly certain that if you flip them in just the right combination, a hidden door opens to a secret temple.) The house was bigger than we needed, and we barely set foot on the second floor, except to use the extra bathroom. The sauna was an unusual treat for us--just the thing for a cool rainy afternoon. My wife also enjoyed the hammock in the screened-in porch, where she sat with her laptop for a few hours one afternoon and got some work done. The windows and fans allow for good cross-ventilation in the house as a whole. Even though a couple of days were hot, we never needed to run the air conditioner in the bedroom. My only minor issue was the bed, which is a double and not a queen—probably fine for most couples if one of them doesn’t suffer from Periodic Limb Movement Disorder. My wife mostly slept on the futon couch in the living room, which was reportedly very comfortable. The mattress was also a bit firm for my taste, although not uncomfortably so, and the upstairs mattress is even firmer. But despite a few very minor quibbles, we loved the house and the surrounding area. Do yourself a favor and read the helpful and thorough notes that Karyn provides on everything from using the facilities to a guide to the Catskills, as there’s lots of useful information. Karyn is also extremely responsive, a very good host. Charming home, terrific location. Great find. This home was a lovely place for my family of four to stay for the week. Our children (ages 3 and 6) had a ball playing in the yard and swimming in the neighborhood pond, where they looked for tadpoles and salamanders. The house was cozy, comfortable, well-maintained with a well-equipped kitchen. The location is secluded and serene but it is also a quick drive to the towns of Woodstock and Phoenicia. Also a great jumping off point for beautiful hikes and kayaking. Karyn made everything easy for us and was generous in providing information about the area and nearby activities. All we had to do is show up and enjoy. Highly recommended for a family getaway. Fantastic getaway in the woods! We stayed at this fabulous home for over 10 days. The property was beyond our expectations. It's spacious, earthy, and clean. 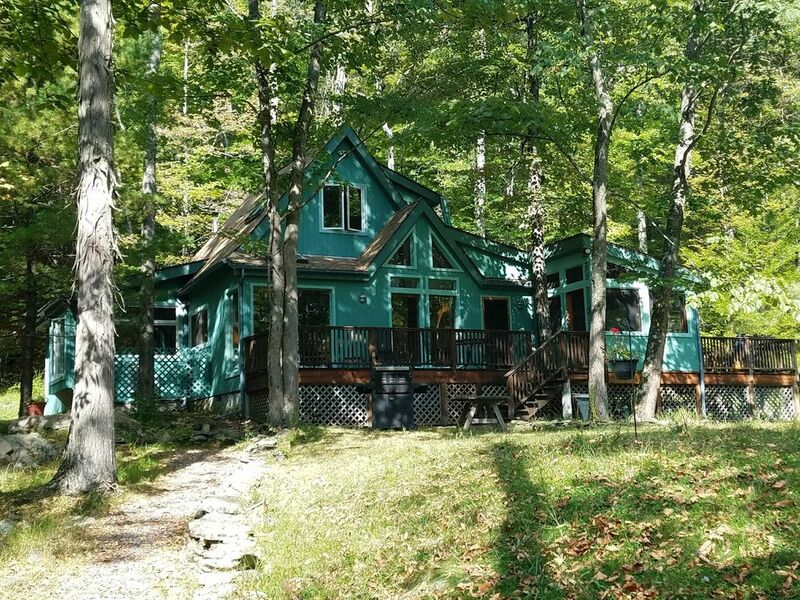 Through the many large windows on the sides and ceiling of the house, we felt embraced by the surrounding canopy of deep woods populated by deer, wild turkey, chipmunks and colorful birds. The place is very quiet and private. There are four decks to choose from, one of which is on the second floor. The kitchen is very well equipped; and we really enjoyed using the sauna and the steam shower. The location is minutes away from either Phoenicia or Woodstock, and very close to a monastery and wooded trails. The owner, who is not on the premises, was very accessible and provided ample information about the area and the house. We loved it, and highly recommend this residence for a short or long stay. Hike and snowshoe out the backyard -- thousands of acres of public land. Swim pond with picnic tables and park-like grounds and yoga classes available in neighborhood. Galleries, fine restaurants, entertainment in nearby Woodstock. Hudson River 30 minutes away for kayaking, sailing and other boating. Easy access to all outdoor recreational activities in the Catskills. Holiday rates can be higher. Some pricing flexibility for stays longer than a week. Security deposit may be higher for longer stays and is refunded within a week, generally sooner.